Aside from the fact that as I’m writing this it is pouring down rain AND thundering, I have got spring on my mind! We just had the most gorgeous weekend ever here in Pennsylvania, and it has gotten me so excited for spring. I was really digging’ the winter weather, bummed that there really wasn’t any snow…but I’m ready to leave that all behind! Since the weather was so amazing, it really had me thinking of ways to bring the spring indoors, since it’s still a tad bit cold to throw the windows open and sit on the porch. 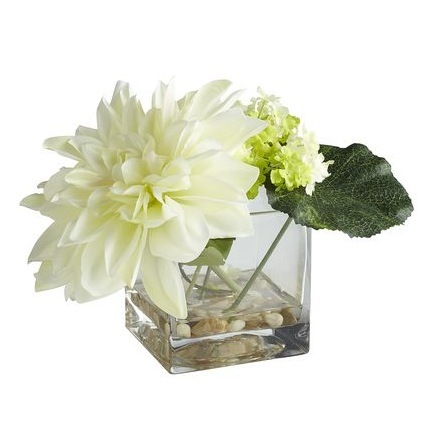 As I was at work, I was browsing through our florals and saw we had this neat little vase with a flower in it. At the bottom of the vase was some stones and some resin to look like water. I loved it and I even thought about purchasing it until I started thinking that I could definitely make it. So, thats what I did. So Pete and I went to Lowes and tried to find something that would give us the look of water at the bottom of the vase. We found this stuff called Super Gloss, which was an epoxy resin. I think it was about $23. 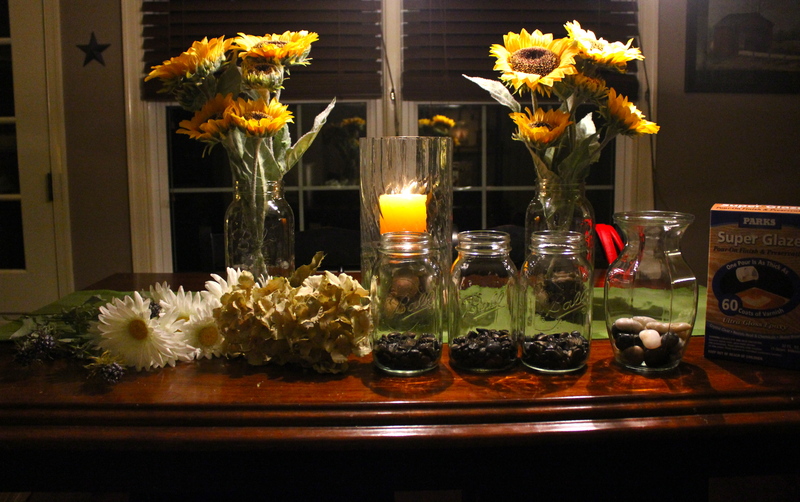 I wanted to use mason jars as my vases, and if you recall, I purchased a ton of them for $1 last year at an auction we went to. I knew they would come in handy! The next thing I needed were some rocks, which I had plenty of in the house for various candles and lanterns, and then I needed flowers. Luckily (or not so luckily, sometimes) I work right next to a Michaels. It just so happens this week, Michaels was having a sale of florals. All florals were 50% off, awesome. 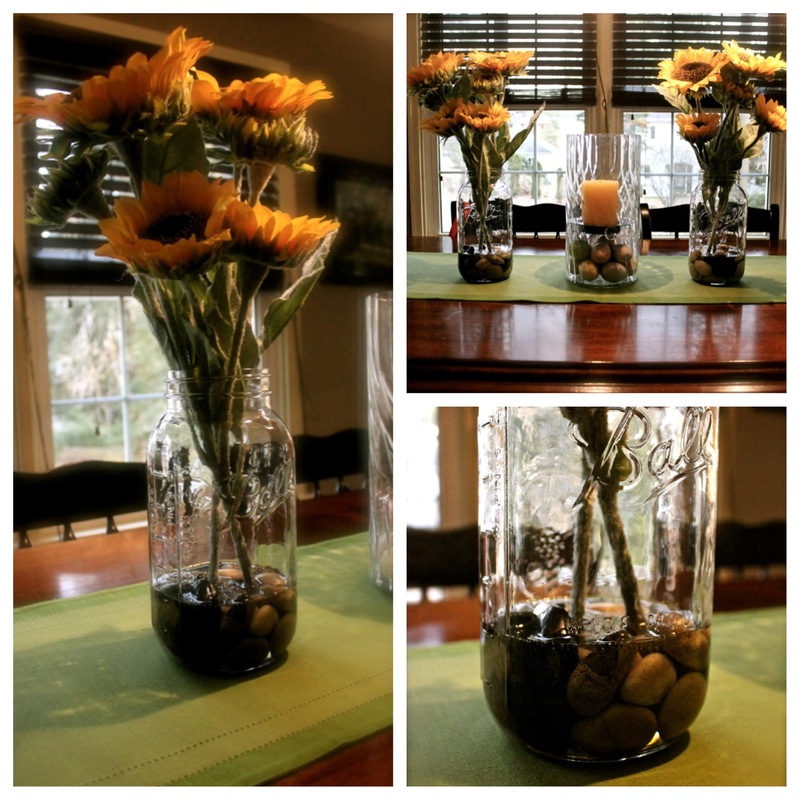 On Sunday, I decided to make 2 vases full of sunflowers. The resin epoxy I used said to mix equal parts of the bottles that came with it. I did a cup of each and stirred it for about 6 minutes. 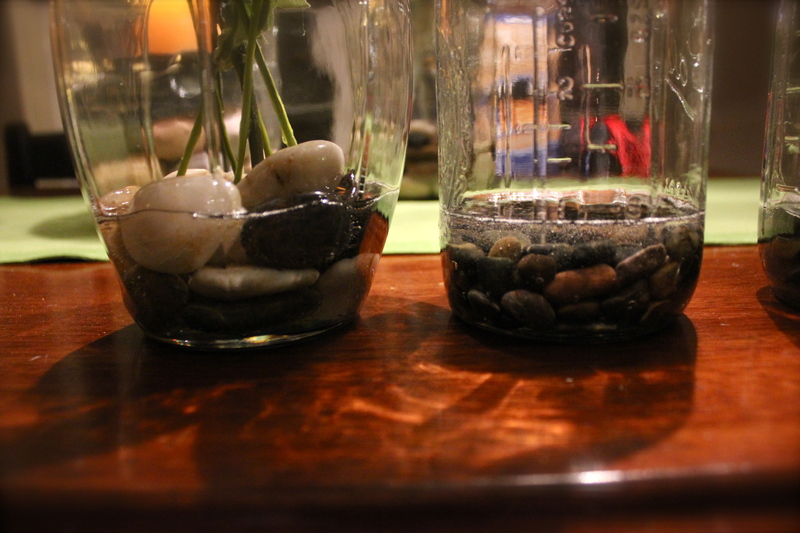 Then I got my jars set up, with the rocks in the bottom, and started to pour the mixture into a funnel, over the rocks. I personally used the bigger rocks and wanted some of them to poke out through the top. Since I used to large mason jars, I put about a cup of the mixture in each jar. Then I added my flowers. There really is no time frame in the instructions for a project like this. It says for a table to dry would take 72 hours. So I have not really messed with the jars too much, but i can tell you I tried to move a flower before and it would not budge. I’m going to give it a few more days and then bend the flowers the way I want them. Once Monday came, I still had a lot of the epoxy resin stuff left (unmixed.) I decided that I had no other use for it so I should just make more of these. So I went and bought more flowers (see! Michaels is TROUBLE.) I went back into the attic to get more jars. This time I also decided to use an old cheap vase I had lying around as well. This time, I used smaller stones in the smaller mason jars. Before when I added the epoxy I wanted the larger rocks poking out, this time since I used smaller stones I wanted the stones to be completely submerged so it really looks like there was water above them. Then, I just repeated the steps from the day before and 10 minutes later I had 4 more pretty vases! All of these projects cost around $45. The epoxy itself cost as much as just one of these already made at work (and the one at work was only about 6 inches high.) What is great about this project is it can be as cheap or expensive as you want it. For me, I had half of the materials already. As far as rocks go, you don’t even have to buy them…just go outside and get them if you want! And as far as what to put them flowers in, you can literally use anything. 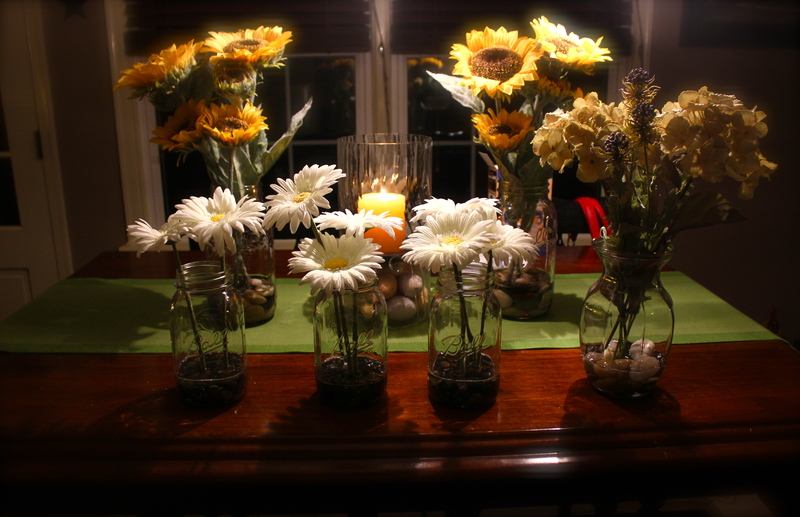 Everyone had old vases lying around, but you can also use old jars from your refrigerator before you recycle them! This is probably the easiest project I have done in a while, and they look so awesome and real when they are done. I definitely encourage you to bring a little spring in the house despite this lingering dreary weather, you will be glad you did! Posted in Home Sweet HomeTagged decorating, DIY, flowers, mason jars, springBookmark the permalink.